Paris Saint-Germain have ended weeks of speculation by confirming Thomas Tuchel will be their new head coach. The former Borussia Dortmund man's reputation as one of Europe's premier coaching talents will be instantly on the line as he ends a year-long sabbatical. Waiting for him in Paris is an enviable array of talent and – providing the club's latest grapple with UEFA's Financial Fair Play rules can be negotiated - vast resources to further embellish his squad in the transfer market. It might be blunt and to the point but this is a non-negotiable in the eyes of PSG president Nasser Al-Khelaifi and the club's ambitious Qatari owners. Emery, it should be remembered, will leave as a domestic treble winner. That achievement did not weigh heavily enough against Champions League elimination at the hands of Barcelona and Real Madrid in the past two seasons. Europe's big trophy is the champagne moment PSG's powerbrokers demand; any varied haul of French prizes amounts to small beer. The superstar forward scored 28 goals in 30 appearances this season after joining from Barcelona for a world record €222million. On Sunday he was named Ligue 1's Player of the Year but all is not quite as rosy as it seems. A couple of on-field spats with the club's record goalscorer Edinson Cavani were unseemly, while reports of a Neymar leading a Brazilian clique in the PSG dressing room pale alongside talk of another blockbuster switch to Real Madrid that seems to be reaching an unhelpful crescendo. 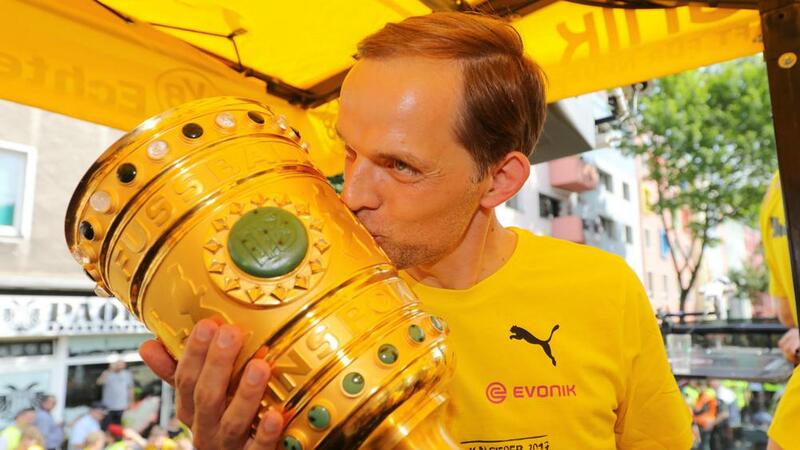 Whether the 26-year-old goes or stays and how he performs if it is the latter will most likely define Tuchel's reign. Neymar leaving would be a body blow, but if he does - or if UEFA demand a balancing of the books that threatens the futures of Kylian Mbappe, Angel Di Maria and others – it gives an opportunity for renewal that Tuchel is more than adept to grasp. Outside of a lavishly gifted array of attackers, with Tuchel's countryman Julian Draxler struggling for regular starts, the holes are easy to spot. Thiago Motta's retirement means the lack of a dedicated midfield holder and Blaise Matuidi's presence in the engine room has not been adequately replaced since the France international joined Juventus. Thiago Silva will be 34 at the start of next season but Emery's gamble at the Santiago Bernabeu showed PSG's defence is not yet ready to move on from the Brazil lynchpin despite Marquinhos and Presnel Kimpembe's obvious potential. A dependable, top-class goalkeeper is also long overdue. The main factor to have checked Tuchel's upward trajectory has been a tempestuous relationship with his employers. Acrimonious departures from Mainz and Dortmund were followed by a season from the outside looking in. His relationship with the BVB squad was also widely reported to be at a low ebb by the end. The combination of a board unwilling to accept failure, with a squad of stars and egos assembled ambitiously but unevenly means Tuchel has flashpoints ahead and must learn how to pick his battles.